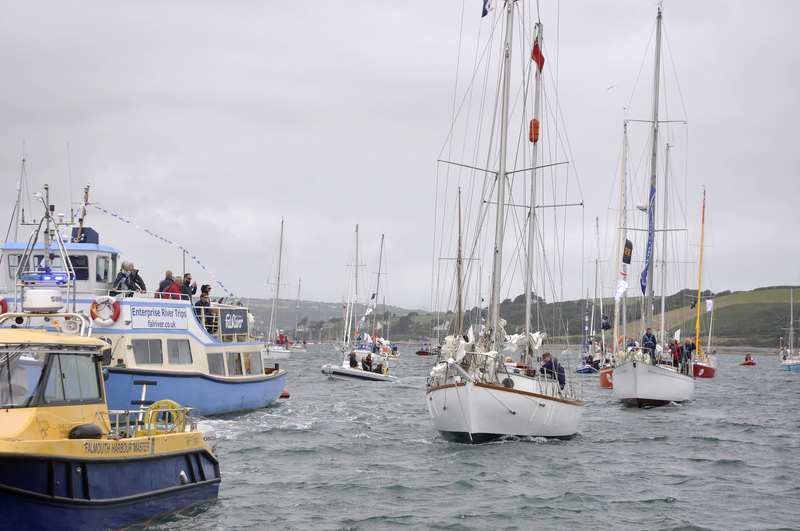 Falmouth celebrates the 50th anniversary of Sir Robin Knox-Johnston’s departure at the start of the 1968 Sunday Times Golden Globe Race. 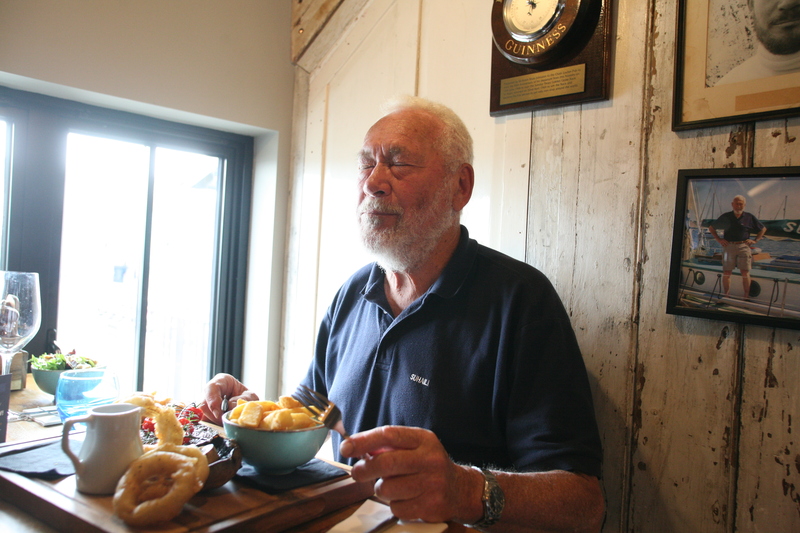 Golden moment... Sir Robin Knox-Johnston resampling his first meal of steak and chips served at the Chain Locker Pub Falmouth 50 years before, with the Guinness barometer mounted on the wall behind. Chart of the 2018 Golden Globe Race course around the world. 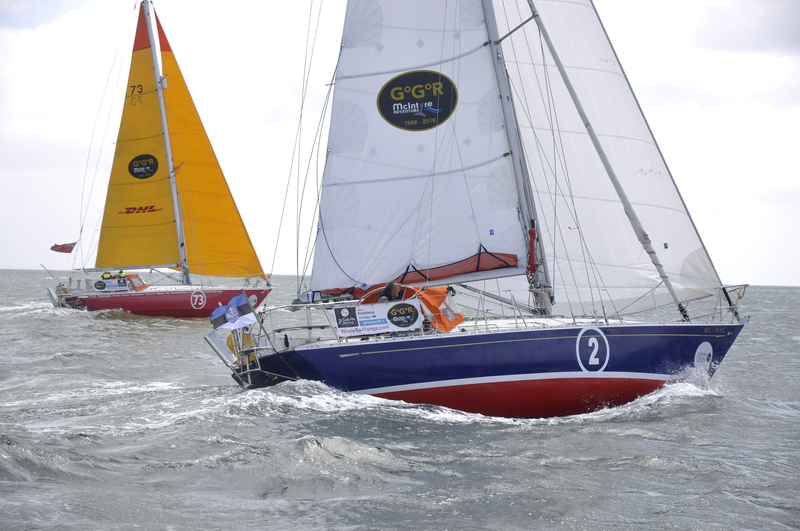 Start of the GGR SITRaN Challenge race from Falmouth to Les Sables d'Olonne, France. 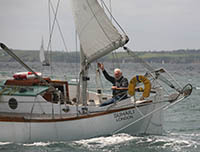 Sir Robin Knox-Johnston's original yacht SUHAILI leads Sir Francis Chichester's historic yacht GIPSY MOTH IV through the 200-strong fleet of well-wishers celebrating the 50th anniversary of Sir Robin's departure from Falmouth to become the first man to sail solo non-stop around the world. 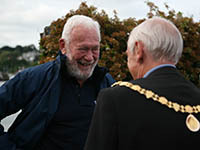 Fifty years to the day after Sir Robin Knox-Johnston set out from Falmouth UK in his rugged 32ft yacht Suhaili to become the first man to sail solo non-stop around the Globe, the British master mariner returned to lead a celebratory parade of sail around the harbour. 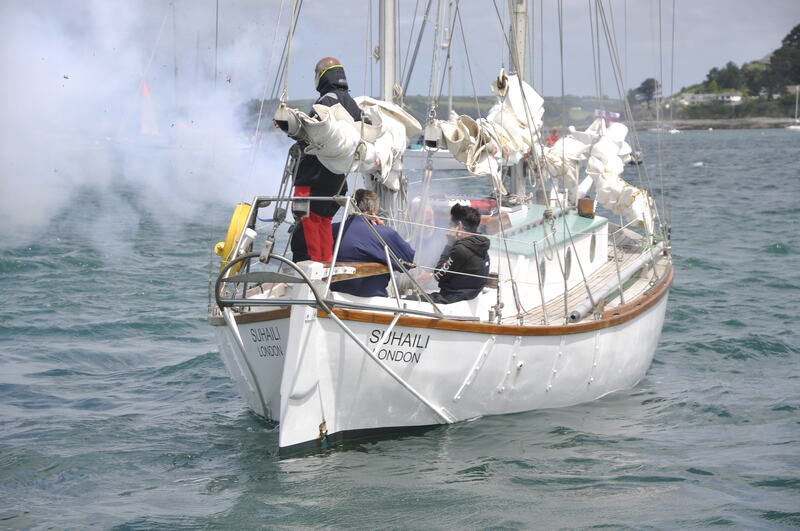 Watched by visitors on every headland, the 200-strong armada of sail criss-crossed between Falmouth and St Mawes before Sir Robin set up a start line between Suhaili and Sir Francis Chichester’s equally famous yacht Gipsy Moth IV and fired the canon to set the 17-strong fleet of 2018 Golden Globe Race yachts on their way to Les Sables d’Olonne for the start of this 50th anniversary solo circumnavigation on Sunday July 1st. 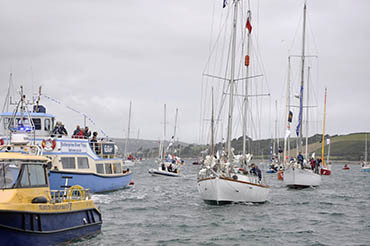 The Suhaili Parade of Sail was the culmination of a 3-day festival involving Suhaili, Gipsy Moth IV, the replica fleet of Golden Globe Race yachts and vessels from around the UK and Europe which had gathered in Falmouth to honour Sir Robin Knox-Johnston’s achievement in the original Sunday Times Golden Globe Race back in 1968/69. One of those memories is of a barometer, ‘borrowed’ off a pub wall before Sir Robin set out on his solo first which he used to monitor the changing weather conditions during his 312 day voyage. 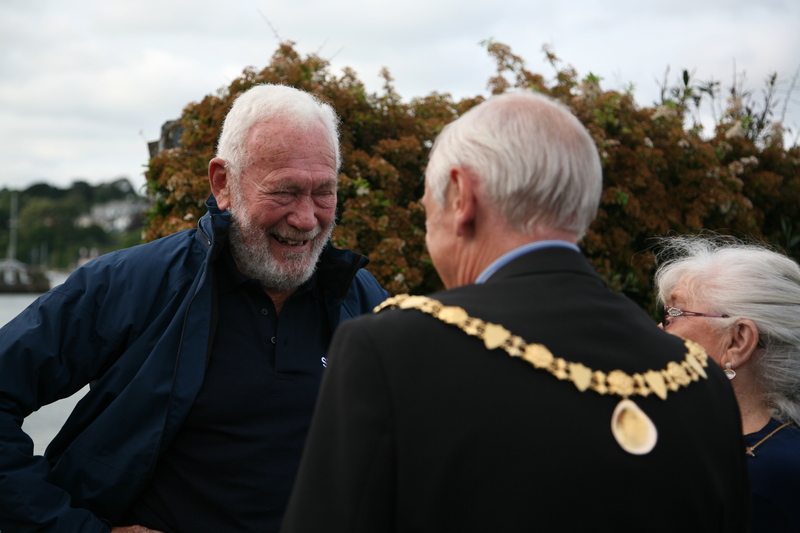 The original was later stolen from his yacht but Sir Robin returned with a replica of that faithful 'A Lovely day for a Guinness' branded barometer to present to the Chain Locker Pub where he stayed 50 years ago before his departure and on his return. And to mark his return to this famous harbour-side hostelry, staff served Sir Robin with the same meal of steak and chips followed by lemon meringue pie he had ordered when he first returned to Falmouth on 22nd April 1969. 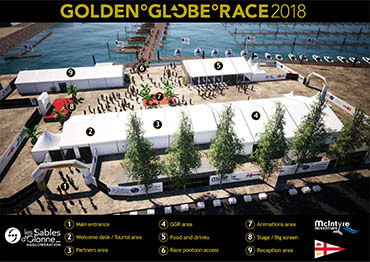 First of the 2018 Golden Globe Race yachts to cross the line at the start of the SITRaN Challenge race to Les Sables d’Olonne was Tapio Lehtinen’s Finnish yacht Asterisk closely followed by 72-year old Jean-Luc Van Den Heede’s French entry Matmut and the two bright orange painted entrants Mark Sinclair’s Australian yacht Coconut and Istvan Koper’s USA/Hungarian entry Puffin. 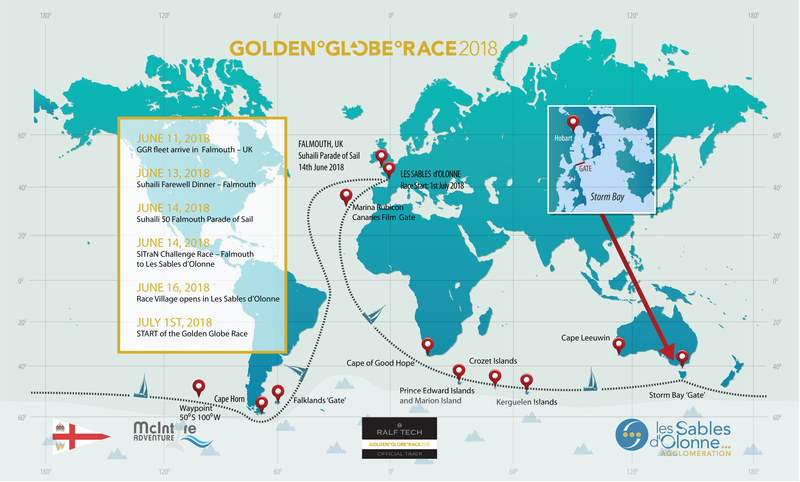 Palestinian skipper Nabil Amra, who has still to complete his 1,000 mile solo proving trial, set out later in the day and must sail a further 300 solo distance once he arrives at the French port in order to qualify for the Race. 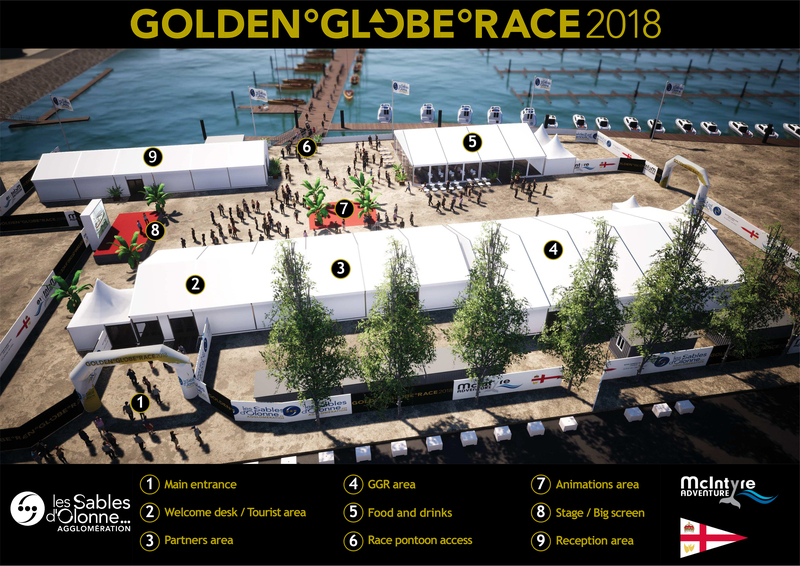 The first boats are expected to finish in Les Sables d’Olonne, France late on Saturday. 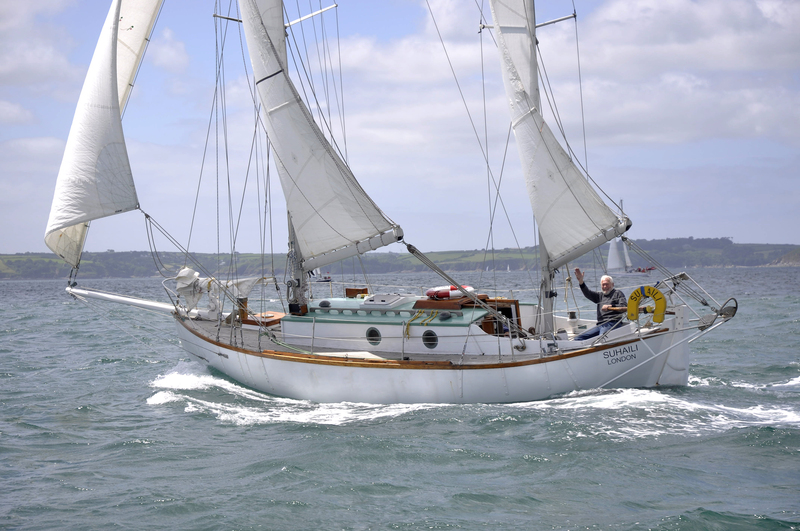 Click Here to view skipper profiles and pictures.